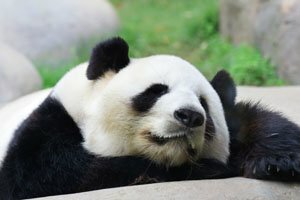 Giant pandas have a distinctive appearance. Their thick black and white fur equips them for life in cool forests. Their white coat with black markings is unique, with black patches round the eyes and ears, black legs, and a black band around the shoulders. And they have cute white tails. They have good geographical memory, hearing, and sense of smell, but their sight is poor. However, they have cat-like pupils, so they can still see adequately to move around at night. 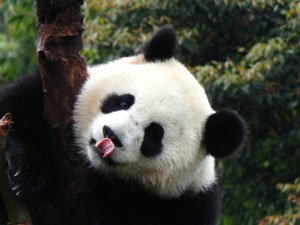 Giant pandas start to grow permanent teeth as they gradually draw to 7 months old. Their back teeth are about seven times the size of a human&apos;s, with a wide surface area. 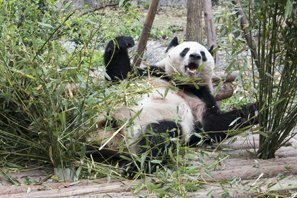 The powerful jaw bones and strong teeth of giant pandas help them crush and grind bamboo. Their Paws Have Six "Fingers"! 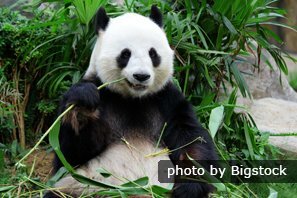 Giant pandas&apos; paws have five "fingers" facing forward and one "thumb" — an enlarged bone at the heel of the paw used for gripping bamboo, climbing trees, etc. How Tall and Heavy are Giant Pandas? 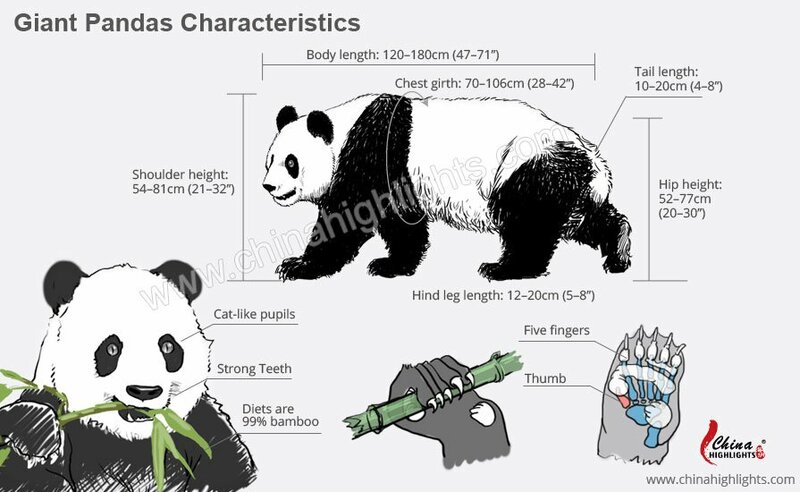 Grown pandas are about 75 cm (2½ ft) tall and 1.5 meters (5 ft) long (see the diagram showing a man and a giant panda). They weigh up to 150 kg (330 lb) in captivity. Females are smaller, weighing up to 125 kg (275 lb) in captivity. Bamboos are the main food of giant pandas. 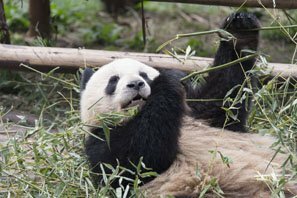 Bamboo is the favorite food of giant pandas, which accounts for 99% of their diet. The bamboos consumed by giant pandas in their current habitats are classified into 40 kinds in 9 genera. Wild giant pandas hunt small animals such as mice once in a while. 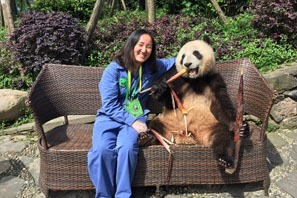 To ensure ample nutrition, giant pandas in captivity are also fed fruits and well-selected feeds, which are made from corn, soybean, wheat, etc. When you visit a zoo you will likely find that the pandas are sleeping. Actually it spends half its day eating and the other half sleeping. You may see them lying flat, on one side, on their stomach; forelegs stretched out, or huddled up. While they are sleeping, they still look very cute. Read more on Giant Panda Behavior. 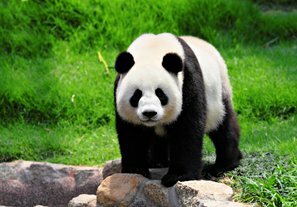 The giant pandas&apos; habitat is in western central China, and the pandas are known as a "national treasure". 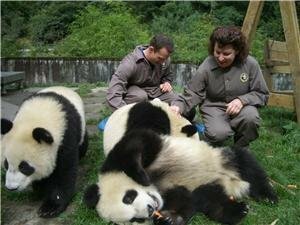 Travelers come to the panda research bases to see the cute pandas. What&apos;s more, travelers can experience a volunteer program to take care of them. 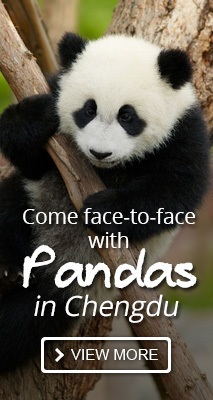 2-Day Panda Keeper and Chengdu Highlights Tour: Join a Panda Keeper Program to get to know more about pandas and take care of them.